“Taking care not to wake anyone, the traveller crept back into the house, shielding his candle. Blaise and Sunni had their fair share of excitement last winter when they were trapped inside Fausto Corvo’s painting. To get them away from everything for a little while, Blaises’ Dad decides to take them with him on a business trip to London. The two art lovers are left to venture the city’s museums and galleries themselves, but a visit to a private museum of the famous artist Jeremiah Starling unlocks a door into the past. The pair then find themselves kidnapped by a mysterious man who seems to know more than he should about them and their travels. I read, and fell in love with, the Blackhope Enigma earlier this year and consequently started following Teresa Flavin on twitter. When I discovered that there would be a follow up to the story I was so excited that I instantly put it on my amazon wishlist. I was highly anticipating its release so you can imagine my excitement when I got an email asking me if I’d like it for review… I actually danced!! My dancing and excitement was all worth it for when I sat down to read this book I instantly got pulled into another world of mystery, suspense and fantasy that only Flavin can create. It mixes time travel with crime and art in a way that I have never seen before and would happily read over and over again. The Crimson Shard is very different to The Blackhope Enigma… in the previous book I always knew it was fantasy; the character were inside a painting and that’s not exactly realistic but it was fascinating… however The Crimson Shard seemed so real. The characters are pulled back in time and the reality of the time they are in really hits you. I could visage everything and I could see how it would happen. The story made me gasp, the characters made me seethe and the writing lured me in and kept me gasping for more! The characters in this book are fantastic! I already knew Blaise and Sunni from the previous book so I won’t cover them too much. They are just as awesome in this as they were in The Blackhope Enigma, if not more! I loved the character development and kept willing for them to get it together, something which I thought had probably happened in the space between the two books but actually didn’t! The side characters were just as awesome as the two main characters. Obviously we have Throgmorton and his daughter Livia who are the baddies… they are the ones who take Blaise and Sunni into the past and trap them there. They were horrible and slimy and that really came out in the writing. They were malevolent characters who really made my skin crawl but they were still fantastically portrayed. Then you get to meet Starling and his workshop boys who I loved, they really did need someone to take them under a wing and look after them… I wish I could have! The nightsneaks were awesome too and they really reminded me of characters you would find in like Dickens and stuff like that! They were great. I think by far my favourite characters had to be the two Nightsneaks, but I wish they were around more! The only downside to having a advance copy of both this and The Blackhope Enigma is that I am yet to see the fantastic illustrations that accompany the finished copies… I will have to get my hands on both finished copies soon, they may well be on my Christmas list! 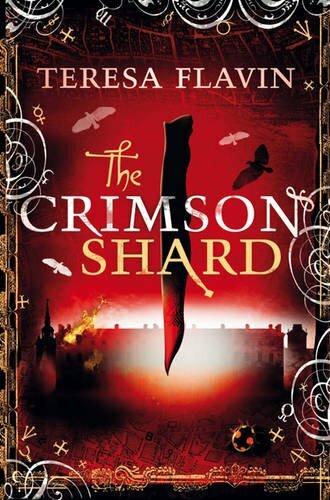 The Crimson Shard was released by Templar Publishing on 1st October. Thank you kindly to Templar for sending a copy in exchange for an honest review and allowing me to be a part of the blog tour. Please come back later on today to see the tour post and have a chance of winning this brilliant book! I’ve not heard of these books, but you have me intrigued!!! I got confused with the Victorian characters in this one again. I must be losing my mind. Fab review. Nice review. Not come across these books but will be on the look out now.